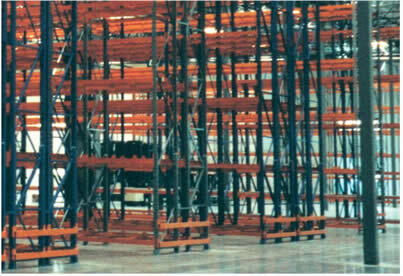 Selective Rack is the most commonly used pallet rack. It allows for the maximum number of SKU facings and is cost effective. Selective rack allows for the most flexibility in slotting design. Lo-Pro Pushback rack systems are used extensively in high-cube storage facilities to provide superior selectivity and cost benefits when compared with other deep storage alternatives. Lo-Pro Pushback systems are available in 2 - 6 deep. 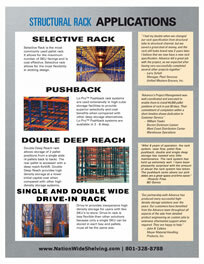 Double Deep Reach rack allows storage of 2 pallet positions from a single aisle (4 pallets back to back). The rear pallet is accessed with a deep reach forklift. Double Deep Reach provides high density storage at a lower initial capital cost when compared with other high density storage systems. Drive-In provides inexpensive high density storage for users with few SKU's to store. Drive-In rack is less flexible than other solutions because only a single SKU can be stored in each bay and pallets must all be the same size. "I had my doubts when we changed our rack specification from structural tube to structural channel, but we saved a great deal of money, and the rack still looks brand new 2 years later. I believe that we now have a new rack specification. Advance did a great job with the project, as we expected after having very successfully completed several other projects together." - Larry Schell | Manager, Plant Services |Unified Western Grocers, Inc.
"Advance's Project Management was well coordinated and executed to enable them to install 44,868 pallet positions of rack in just 60 days. Their commitment of completion within a short timeline shows dedication to Customer Service." "After 8 years of operation, the rack system, case flow, pallet flow, pushback, double and single deep storage has needed very little maintenance. The rack system has held up extremely well. I have been pleasantly surprised with the amount of abuse the rack system has taken. The pushback racks above our pick aisles are a great space and time saver." "Our partnership with Advance has produced many successful highdensity storage solutions over the years. Our customers have benefited from the Advance team throughout all aspects of the sale from detailed product engineering on custom jobs to extensive aftermarket support when required. They are happy to help." - John R. Calkins | Meyer Material Handling Products, Inc.
* Consult Engineering for seismic applications. Open span is selected from maxim u m of 1st or 2nd level. ASD (Allowable Stress Design) & LRFD (Load & Resistance Factor Design) 1.92 Safety Factor, 50 ksi min., yield hotrolled structural channel and 1-1/2" x 1-1/2" x 1/8" diagonal bracing. Meets current RMI specifications. Capacities based on uniformly distributed loads per pair of beams, minimum of one cross bar per pair of beams, 65 ft. lb. minimum torque on all beam hardware, L/180 maximum deflection. Meets current RMI specifications. 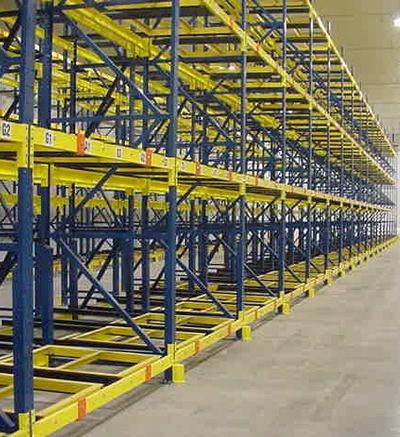 Cross bars are typically used to help prevent misplaced pallets from falling between the load beams. The addition of cross bars will also increase beam capacity and reduce spreading. Standard construction is from high strength 2" x 2" x 1/8" structural angle. "L" is equal to upright frame depth. Row Spacers are used for typical frame to frame spacing. Frame Spacers must be used with frame to post connections. Heavy duty rub rails are used for deep storage systems to protect uprights against forklift damage. Standard Foot Plates are punched with (2) 5/8" holes to accommodate (1) or (2) 1/2" anchors. Other foot plate configurations are available. Heavy Bottom Horizontals will significantly reduce damage to uprights caused by forklift impact. Doublers are frequently provided in the aisle "impact zone" to reduce damage from fork lifts. Doublers are also used to increase column capacity for heavily loaded uprights. Column protectors are used to reduce damage to the front of the upright from fork lift impact. 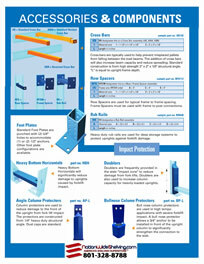 The protectors are constructed from 1/4" heavy duty structural angle. Dust caps are standard. Bull nose column protectors are used in high tempo applications with severe forklift impact. A bull nose protector allows a 3/4" anchor to be installed in front of the upright column to significantly strengthen the connection to the slab. 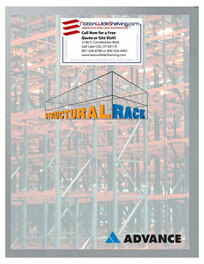 Why Use Advance Structural Rack? 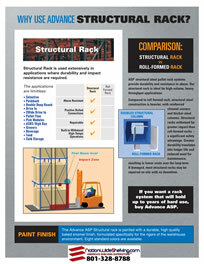 ASP structural steel pallet rack systems provide durability and resistance to abuse. 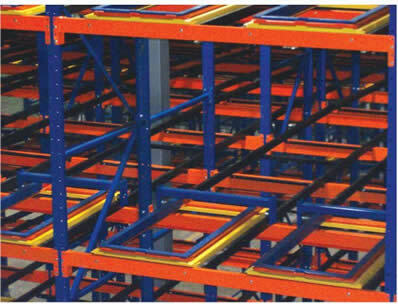 Our structural rack is ideal for high-volume, heavy throughput applications. Compared to roll-formed rack, structural steel construction is heavier, with reinforced channel corners and thicker steel columns. 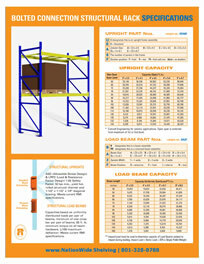 Structural racks withstand far greater impact than roll-formed racks - a significant safety advantage. Greater durability translates into longer life and reduced need for maintenance, resulting in lower costs over the long term. 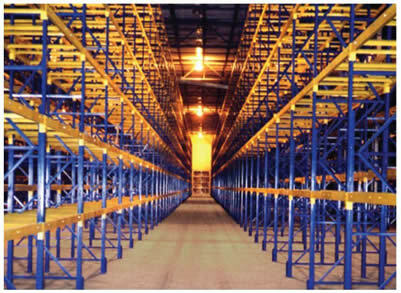 If damaged, most structural racks may be repaired on site with no downtime. If you want a rack system that will hold up to years of hard use, buy Advance ASP. 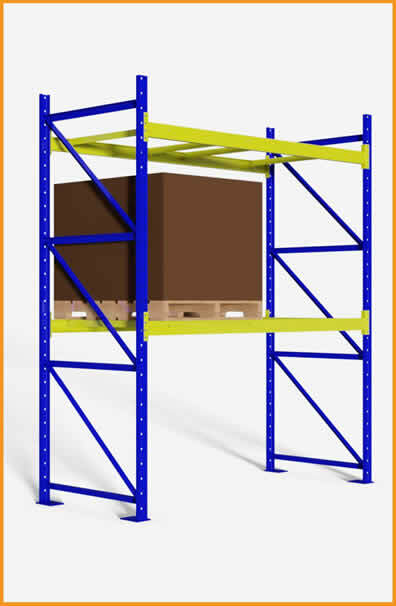 The Advance ASP Structural rack is painted with a durable, high quality baked enamel finish, formulated specifically for the rigors of the warehouse environment. Eight standard colors are available. 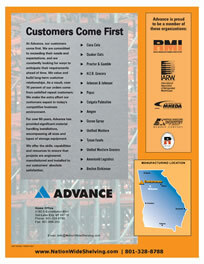 At Advance, our customers come first. We are committed to exceeding their needs and expectations, and are constantly looking for ways to anticipate their requirements ahead of time. We value and build long-term customer relationships. As a result, over 70 percent of our orders come from satisfied repeat customers. We make the extra effort our customers expect in today's competitive business environment. For over 50 years, Advance has provided significant material handling installations, encompassing all sizes and types of storage equipment. We offer the skills, capabilities and resources to ensure that projects are engineered, manufactured and installed to our customers' absolute satisfaction.